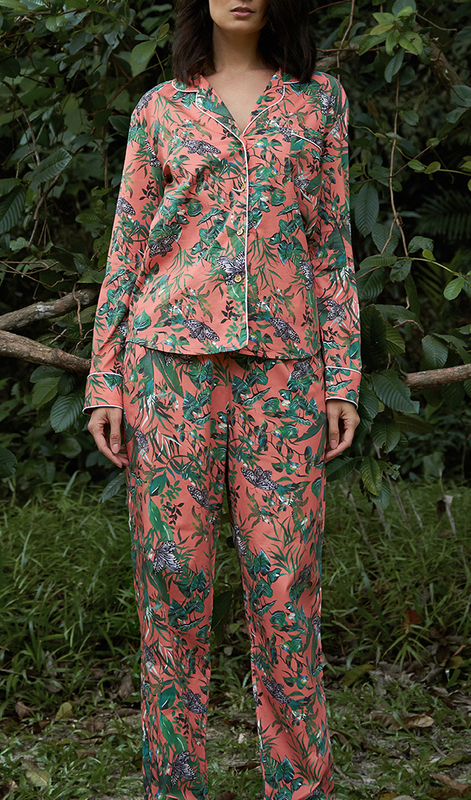 Let yourself float to sleep in our botanical and butterfly print - Flutter free. The Kipandi butterfly park in Kota Kinabalu houses over 1500 butterfly specimens. In collaboration with the Sabah Wildlife Department, the park has specially built enclosures to house some of the rarest and endangered species of insects and plants. You’ll find wooden buttons, contrast piping, breast pocket and drawstring trousers. Luna & Noon's pyjamas are designed to be a relaxed, loose fit; the perfect PJ’s to comfortably lounge in. If you prefer things a little more snug we recommend you size down. 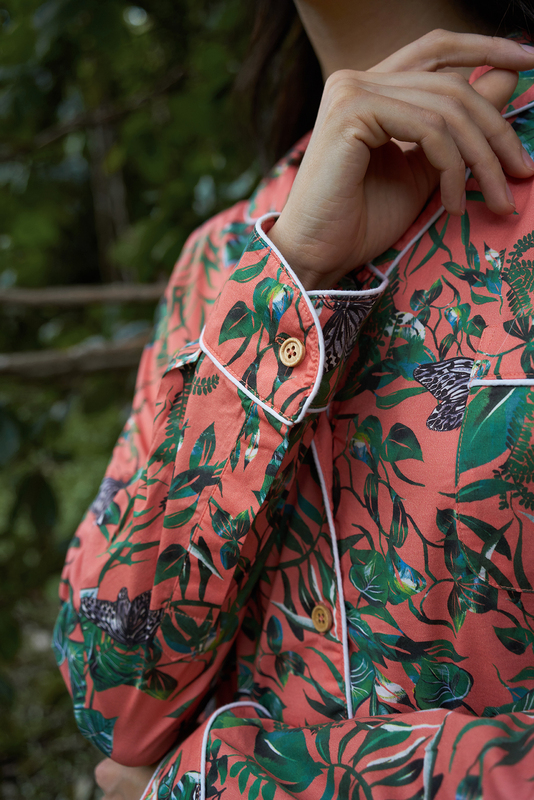 Care: We want you to lounge with us for many years, so please follow these simple guidelines to help your L&N pyjamas look as fresh as the day you purchased them. • Iron on the reverse. Fabric: 95% cotton, 5% spandex. Although we’d love to be 100% cotton, here at L&N we also want a stress-free life. The 5% spandex provides added comfort, hand feel and the most important factor; it’s easy to care for (less ironing is always a winner). 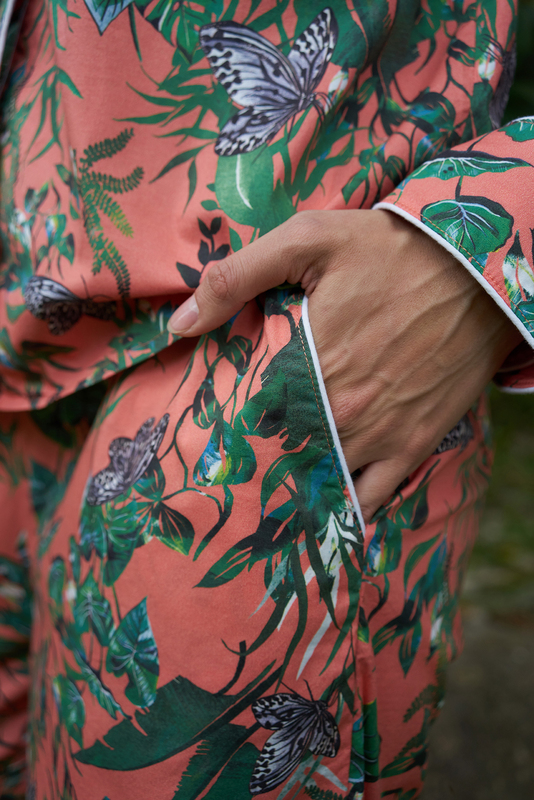 The unapologetically bold and funky designs that are printed on the pyjamas - the definition of unwinding in style. Wear it in bed or wear it when you’re heading out to a little beach town. Luna & Noon is a brand that encourages relaxation. In a world where it’s constantly buzzing, it is important that we remember to unwind. Especially in style. All designs are inspired by their travels, picking up styles and patterns from around the world. All of the prints are hand painted and exclusively designed for them. Each comes with a unique story that is to be told.